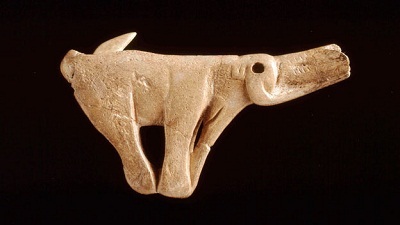 The recently opened exhibition of Ice Age Art at the British Museum brings together a selection of carvings, sculptures, engravings, models and drawings found in Europe and created during the last Ice Age between 10,000 and 40,000 years ago. The collection of art and artefacts has been brought together to demonstrate that our ancestors had the same concerns as modern artists; to explore scale, volume, light, movement and perspective. To bring home this argument even further, several modern sculptures and paintings by Mondrian, Henry Moore and Matisse share the same space as the prehistoric works of art. 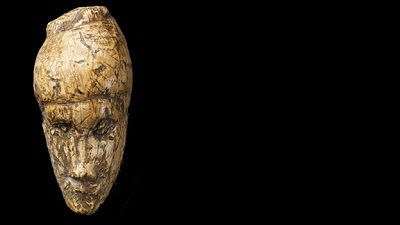 Information supplied close to the works on display explains that Picasso was fascinated by a carving of a woman made from mammoth ivory, and found in the Lespugue caves in France. Many of the objects on display are on the small side, nor more than a few inches high. 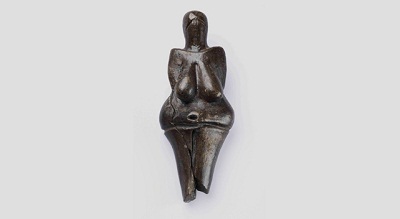 Frequently the females are depicted as being pregnant, in childbirth, or displaying figures that show they have born children. The images in the exhibition are carved from ivory, antlers, bone, limestone and sandstone, or baked clay. They were coloured using red ochre and yellow iron oxide, and carvings were made by a burin, a bone scraped until it was pointed enough to carry out the job. 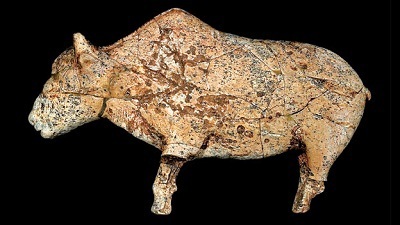 Other shapes found, or carved, were of animals: deer, lions, horses, bears and bison. There are several of women, men and heads, including a fascinating study of a man with a lion's head; a short video reproduces the process of making a replica, taking a total of 400 hours. And just to prove that early man was concerned with useful and decorative objects, there are weapons and jewellery too. You will leave the exhibition feeling that modern society has invented nothing artistically new, but may possibly only have evolved, and that the minds of contemporary artists are no more modern than those who lived tens of thousands of years ago. If you feel inspired to learn more there are lectures and workshops at the Museum to feed your thirst for knowledge. Further information is on the website.